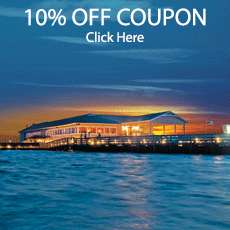 We know you have numerous dining choices on the Outer Banks and we’re delighted that you have come to our restaurant. Our customers frequently ask us to explain the “Tale” of the Whale and we’re always happy to oblige. Don and Carole chose Whalebone Junction as the perfect location for the pursuit of their dream. No other restaurants were using a whale motif at that time and since Don and Carole were both interested in “saving the whales” the name they chose seemed appropriate. It has been our hope that folks will support the plight of these gentle giants as they continue to be threatened by man. 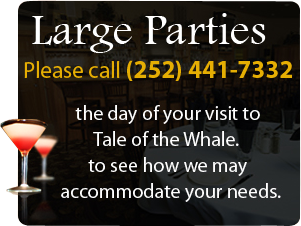 The Tale of the Whale Restaurant operated successfully for over 20 years under Don’s guidance and direction until his passing in 1997. Carole continues to uphold the tradition , along with their son Dan and his wife Kathy, out of a strong respect for Don and his high standards of fine dining. Their desire is for The Tale of the Whale to continue to meet Don’s ideals for many generations to come. We hope your dining experience here is a pleasant one and that you will allow us to become part of your family’s tradition here on the Outer Banks.